You may need an arena for your event, but planning the event does not need to be an arena-sized task. Let us help you plan your next large meeting, event or concert in the BB&T Arena at NKU. 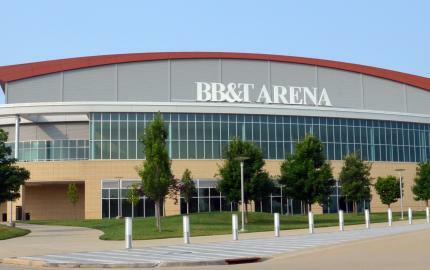 Opened in 2008, the $64 million, state-of-the-art BB&T Arena is the region's premier, multi-purpose arena facility designed specifically for hosting sporting events, large faith-based celebrations, regional events & competitions, training camps, motivational rallies & conventions, live concerts, family shows and so much more. Located on the beautifully landscaped campus of Northern Kentucky University, the 245,000 square foot, bowl-shaped arena boasts a capacity of nearly 10,000 seats for most events—9,400 for basketball games—and has a specialized curtaining system that allows the venue to be cut to half size. You'll find two decks of seating, 12 luxury boxes, two party decks that accommodate up to 100 people and two party suites that seat up to 50. You and your guests will enjoy ample on-site parking, a safe suburban location and numerous facilities for private meetings and conferences, along with full service catering options and many modern amenities. The BB&T Arena—proudly managed by SMG, the world leader in facility management— is committed to unmatched customer services before, during and after your event. You'll find a wide selection of hotels located within a 6- to 10-mile radius of the BB&T Arena. Many of them are award-winners for outstanding service and they encompass a range of room rates wide enough to meet any budget. At these great hotels, you and your guests will enjoy exceptional accommodations and numerous family-friendly amenities, along with the extra meeting space you may require for your event.